Alloy.com is having a HUGE online sale, up to 80% off. If you were disappointed with your Christmas gifts, splurge and check out this site. And check out the price tags…. Since it’s the holidays, and I feel giving, I’m going to share something with you all. Something priceless. COUPONS! Alloy.com will give you free shipping when you spend $75 and use coupon code SHIP75A. Also, all sweaters and jeans start at just $19.90 while supplies last. Charlotte Russe is having a huge sale, with tons of winter styles marked down to $5, $10, and $15, through 12/29. Also, boots and shoes are buy 1, get 1 for $15 through 12/29, and denim starts at $10 through 12/29 as well. Debenhams is having their biggest sale ever, with up to 70% off thousands of lines. The sale ends on January 5th, so shop now if you’re interested! dELiA*s is offering free shipping on orders over $75 with code DATAFF. Dorothy Perkins is having a sale, with up to 50% off site-wide! Check it out now for the best selection. Also, they will be offering free UK standard delivery on orders over £30 from 12/26 through 12/29. Folica is offering $20 off orders of $75 or more plus free shipping with code HOLIDAY75 (ends 12/31). French Connection is having a sale, with an extra 50% off sale items – use code 50FCLM (ends 1/3/11). Kohl’s get an extra 15% off your order with code HOHOHO15 (ends 12/28). Macy’s prices will be slashed 10-15% off sitewide, plus orders over $99 will ship for free with code HOLIDAY through 12/29. Miss Selfridge just launched their Christmas Sale, with up to 50% off across the site, while supplies last! New Look‘s newest sale starts 12/24, and prices are slashed up to 50% off! Don’t miss it. Nordstrom‘s Winter Savings event starts today – get 33% off women’s apparel, shoes, and accessories from now through January 11th. Sephora.com will give you a free stocking stuffer (while supplies last) with code STOCKING. Or, buy a Philosophy Limited-Edition Hope in a Jar and receive FREE standard shipping – use code FAVE. Or, get a 1-week supply of Bremenn face cream with any purchase and code BREMENN. Target is having an End of Season Sale, from now through 1/1. Also, save 5% when you use your Target REDcard. And spend $50, get free shipping on select accessories, cosmetics, and more. The Body Shop is offering up to 60% off in their sale section from now through 1/18/11. Also, get free shipping when you spend $25 through 1/2/11. The Limited is offering up to 70% off during the Red Hot Sale, which starts 12/24! Everyone has a guilty pleasure. What’s yours? The Fashion Set Spring 2011. Gainsville lovin’ over Thanksgiving break. I love this silk black long sleeved button down with jeans, really relaxed look & feel and hello!…it’s silk. Really easy article of clothing to acquire, and well worth it. I’m one for Florida winter attire, which consists of warm pastels instead of the typical winter/fall collection of all drabby darks. I think us Floridians can pull it off, since the coldest it gets around here in 50, maybe-sometimes. Even though the second it hits 65 we pull out the boots and jackets…We’re lucky we don’t have to pack on the jackets, gloves, earmuffs, and boots (even though sometimes we want to) and we don’t use that to our advantage. We can pull off blouses on New Years Eve & cardigans on Christmas. I mean why not? Got a friend who’s a photographer? It’s not a lense…it’s a thermos!! Are you stuck when it comes to shopping for christmas? Look no further. http://www.etsy.com/gifts?ref=buy_page_gifts is the perfect place to shop when it comes to finding unique gifts for your friends & family. I know I crossed some items off of my list thanks to Esty. They also integrate FB onto the site too so you can find personalized gifts for your FB friends according to their FB page…neat, huh? follow me. or, whatever it is you do on tumblr…. It’s images like this that make me wonder, then why is American Apparel going out of business? (American Apparel to admit that it now has debts of $120m and is losing money at a rate of nearly $30m a year.) AA is a style that forces you to be sizes -0 through 4 or else it just doesnt work. So unless they incoprporate some more-to-love styles into their brand, it’s all downhill from here. 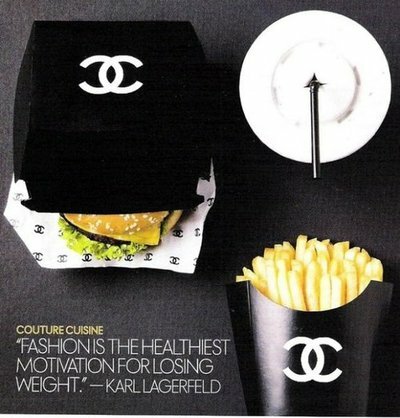 And another thing that is confusing about this picture, I would LOVE to eat a Chanel burger & fries, wouldnt you? If you were to take one piece of advice away from my blog, take this.